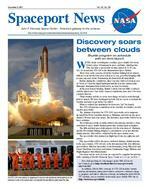 November 2, 2007 John F. Kennedy Space Center Americas gateway to the universe Spaceport News http://www.nasa.gov/centers/kennedy/news/snews/spnews_toc.html Vol. 47, No. 23 Discovery soars between clouds W ITH clouds crowding the coastline, space shuttle Discovery found a place of harmony in space and time, climbing into blue sky after a spectacular on-time launch at 11:38 a.m. Oct. 23 on mission STS-120 to the International Space Station. There were early concerns about the weather shifting before launch, with an ocean breeze forecast to roll in at 11 a.m., possibly bringing with it some rain and clouds. Fortunately, the front held off until liftoff. Earlier, during the countdown, other concerns surfaced about an area of clear ice near the liquid hydrogen umbilical on the external tank. Managers determined this would not be an issue for launch. said the launch was one of the cleanest countdowns here since Ive been a launch director. Both weather and the ice issue were things we had to work through prior to launch. We were challenged by both. All we can do is evaluate the weather and hope to get lucky, he added. When it counted, the unanimous decision was go for launch. The STS-120 mission is ambitious in its schedule of activities, includ The primary objectives for STS-120s spacewalks are to temporar ily install the Node 2 module, known as Harmony, and relocate the space these activities. The fourth spacewalk, recently added to the mission, involves a dem onstration of space shuttle thermal protection system repair techniques. and the Pressurized Mating Adapter-2, scheduled to occur just after the shuttle mission. This will be conducted by the space station crew. eleven. Five spacewalks will be the most conducted during a shuttle mission spacewalkers: Mission Specialists Scott Parazynski, Doug Wheelock and Daniel Tani from Discovery, and station Commander Peggy Whitson and Flight Engineer Yuri Malenchenko. Discovery and its crew of seven are expected to complete the mission with a landing at NASAs Kennedy Space Center at 5:11 a.m. on Nov. 7. Shuttle program on schedule with on-time launch For a full spectrum of color images on the Web of Discov erys launch, go to http://mediaarchive.ksc.nasa.gov/search. cfm?cat=101 In addition, NASA Web coverage of STS-120 includes current mission information, interactive features, and news conference imag es, graphics and videos. Mission coverage, including the latest NASA TV schedule, also is available on the main space shuttle Web site at: http://www.nasa.gov/shuttle. The STS-120 crew shares its eagerness for launch with spectators before getting on the Astrovan to ride to the launch pad. Commander Pamela Melroy (right) leads the way. November 2, 2007 Page 2 SPACEPORT NEWS Buoniconti speaks about new beginnings Employees recognized for modication efforts on STS-117 external tank S Space Alliance workers were recently recognized for their unparalleled efforts in repairing the foam on the external tank for the STS-117 mission. In late Feb ruary, while on the launch pad, space shuttle Atlantis external tank received hail damage during a severe thunderstorm that passed through the Kennedy Space Center caused visible divots in the giant tanks foam insulation as well as minor surface damage to about 25 heat shield tiles on the shuttles left wing. The team worked 24 hours a day, seven days a week, for 70 days to complete the unprecedent ed repairs. Their efforts ranged from assessing the damage, building unique scaf folding to access the areas, devel oping new tools such as a device that became dubbed the pencil sharpener and using several repair options, from sanding to injecting foam. At a special ceremony on Oct. 10, Shuttle Program Manager Wayne Hale presented team mem bers with medallions to honor their work. Space doesnt permit naming all of the individuals who were recognized. The NASA personnel Anthony P. Bartolone, William R. Becker, Brad J. Berman, John B. Blue, James S. Bolton, Todd Bran denburg, Greg S. Breznik, Christopher Broadaway, Jack Burritt, Daniel R. Cal lan, Amy C. ard W. Care, Katie E. Carr, Joseph C. Cian ciola, George T. Cole, Richard B. Danyus, James H. Davis, Simon Davis, Otis E. Deal, Darrell Deweese, Gregg M. Eldridge, Romeo C. Enriquez, Thomas F. Ford, Michael B. Friz zell, Brian K. Goode, Gordon B. Grooms, Eugene T. Healey, Christopher E. Hill, Christopher Hoffman, Steven G. Holmes, John Honeycutt, Gary W. Jerome, John E. Key, Diana Kiesling, Charles Brian Miller, Thomas A. Miller, Charles A. Mister, William Ondoc sin, Brent A. Pautler, Jeffrey C. Pi Kenneth C. Priske, Alison B. Protz, Jorge E. Rivera, Robert Russo, ling, Shawn Selvidge, Jonathan B. Sharpe, Eartha M. Shoemaker, Clayton B. Shrock, Wandaanne A. Sigur, Jimmy D. Sisco, Dennis K. Sparks, Jeffrey S. Sparks, Robert F. Speece, Brian Steeve, Fernando M. Teran, John W. Thiers, Mary A. Thompson, Jeffrey S. Thon, Robert D. Vega, Gregory S. Vinyard, Ken neth J. Welzyn, Timothy White, Chad Woods, Roy C. Worthy. Shuttle Program Manaager Wayne Hale congratulates Michael L. Young, director of Engineering Integration, for his hail dam age work on the STS-117 external tank. A cake decorated for the celebration features both sides of the medallion given to the team members. You have been selected to receive this medallion in recognition of your vital contribution to the recovery of the STS-117 External Tank significantly damaged in a hail storm. At podium, Nicole DelVesco, DAAWG co-chair and NDEAM event co-chair; seated from left, Annie Miller, NDEAM event chair person; Susan Kroskey, DAAWG executive advisor; and Marc Buoniconti, NDEAM special guest speaker. By Linda Herridge Staff Writer M ARC Buoniconti is looking forward to the day when he can stand up and walk away from the wheelchair he has been in for 22 years. The son of former Miami Dolphin and Hall of Famer Nick Buoniconti suffered a spinal cord injury during a football game in the neck down. Buoniconti was the guest speaker during a National Disabil ity Employment Awareness Month event sponsored by the Disability Awareness and Action Working Group at Kennedy Space Center. He told an attentive audience that what he thought was the end of his life was very much a new beginning. I am humbled and over whelmed to be here at Kennedy Space Center, Buoniconti said. It was exactly 22 years ago today that I was paralyzed Oct. 26. During treatment at the Miller sity of Miami, Buoniconti met Dr. Barth Green, a renowned neurosur geon with a vision to bring the best a cure and improve function and quality of life for people paralyzed by spinal cord disorders. Thus was born the Miami Project. Buoniconti serves as Ambas sador for the Miami Project to Cure Paralysis and president of the Buo niconti Fund to Cure Paralysis, the Miami Projects international fund raising arm founded by his father. My life has purpose, Buoni conti said. And I have some excit ing news to share with you. According to Buoniconti, the projects laboratory research has brought them very close to a cure. FDA-approved human clinical trials using cellular transplants to replace damaged nerves and cells. Buoniconti said the Miami Project has helped to change the way the world looks at paralysis. We are faced with physical and mental chal lenges. We also want challenge in life, Buoniconti said. You can con sider me a member of your DAAWG team. He encour aged disabled workers to get out there and live, get out there and work. Center Director Bill Parsons said it takes an entire team to launch a shuttle and process the hardware. That team includes disabled workers. He praised the DAAWG and said the group does great work here at Kennedy. Susan Kroskey, Kennedys DAAWG executive advisor, said Buoniconti topped the scales in bringing awareness of spinal chord injuries to the Kennedy commu nity. SPACEPORT NEWS Page 3 November 2, 2007 By Linda Herridge Staff Writer K ENNEDY Space Centers 17th annual Business Op portunities Expo on Oct. 16 provided an opportunity for local and national business leaders to learn more about how to contract with the government and for gov ernment purchasing agents to learn what local and national vendors have to offer. The one-stop envi ronment at Port Canaveral Cruise Terminal 4 was sponsored by the NASA/Kennedy Prime Contractor Board, 45th Space Wing and Ca naveral Port Authority. event, which featured 175 exhibi tors and 24 NASA small business specialists and contractor small business liaisons. Other NASA cen ters participated, including Head quarters, Goddard Space Flight Center, Johnson Space Center, shall Space Flight Center, Ames Research Center, Glenn Research Center and the NASA Shared Ser vices Center. Dudley Cannon, director of welcomed exhibitors and attendees to the expo. He said the event is an example of the successful part NASA and the Port Authority. It is also an example of the partnership between government and industry, which has made the is today, Cannon said. The expo showcases both large and small businesses and their important role in helping the Air Force guard our nation from space and NASA explore our solar system and be yond. Other speakers included Fred Kirschstein, district director for Space Coast Economic Develop chairman and port commissioner Air Force Col. Stephen Butler, vice commander of the 45th Space Wing Hattaway, NASA associate director and Glenn Delgado, associate ad zation at NASA Headquarters. Hattaway said what makes the expo unique is the concentration of primarily small business exhibitors from Brevard County and Central Florida. The small business community is vital to our economy and our mission success, Hattaway said. This event provides these busi nesses the opportunity to showcase their capabilities to NASA, the Air Exhibitors included vendors from a variety of product and ser vice areas such as computer tech nology, communication equipment and services, construction, engi neering and safety products. During the expo, NASA Small Business Specialist Connie Annual Business Opportunities Expo provides companies one-stop shopping Wilcox announced the 2007 Kenne dy contractor awards. The Boeing Contractor of the Year, SGT Inc. was awarded Small Prime Con tractor of the Year and Bionetics was declared Subcontractor of the Year. These companies will be rec ognized during Kennedys annual awards ceremony in November. The expo is managed by NASAs Central Industry Assis port to businesses desiring to do business at Kennedy. From left, clockwise, Business Expo participants talk with representatives from ITT engineering, NASAs Ofce of Small Business Programs, Rockwell Automation, and Florida Motion Control. Page 4 November 2, 2007 SPACEPORT NEWS By Steven Siceloff Staff Writer T HE Wright Flyer got only a few feet off the ground moon 66 years later. A lead cargo tag that took months to cross the Atlantic Ocean from England to the nascent colony at Jamestown re cently made the same crossing in minutes. tional world of Star Wars look realistic has taken a real trip to the stars aboard space shuttle Discovery for mission STS-120. From pieces of history to articles of pop culture, the assort ment of items astronauts have taken with them into space is as varied as the world the artifacts represent. such as a stuffed teddy bear that STS-116 Commander Mark Polansky took into orbit. The bear was a replica of one owned the replica to a museum for its collection. For the Star Wars prop, a lightsaber handle that was used tors dressed as characters including Chewbacca and X-wing to NASA's Johnson Space Center in Houston, where it was packed into a shuttle locker and taken to NASA's Kennedy Space Center for loading aboard Discovery. ducted eight spacewalks, said there is a symbolic tie between the lightsaber and the real-life work NASA does in space. reality as far as what we do, and it's only just time, really, From historical to pop culture, artifacts hitchhike for ride in space (Above) The original lightsaber used by Luke Skywalker in the lm Star Wars was stowed on Discovery for its launch to the International Space Station on mission STS-120. Taking the science-ction weapon into space commemorates the 30th anniversary of the lm. The saber will be taken to Houston for display at the Space Center after Discovery returns to Earth Nov. 7. (Above) Employees near the Shuttle Landing Facility at NASAs Kennedy Space Center watch space shuttle Discovery climb through clouds into blue sky on mission STS-120 to the International Space Station. Discovery carries seven astronauts, the Harmony module payload, and a few other unique items. Page 5 November 2, 2007 SPACEPORT NEWS By Steven Siceloff Staff Writer T HE Wright Flyer got only a few feet off the ground moon 66 years later. A lead cargo tag that took months to cross the Atlantic Ocean from England to the nascent colony at Jamestown re cently made the same crossing in minutes. tional world of Star Wars look realistic has taken a real trip to the stars aboard space shuttle Discovery for mission STS-120. From pieces of history to articles of pop culture, the assort ment of items astronauts have taken with them into space is as varied as the world the artifacts represent. such as a stuffed teddy bear that STS-116 Commander Mark Polansky took into orbit. The bear was a replica of one owned the replica to a museum for its collection. For the Star Wars prop, a lightsaber handle that was used tors dressed as characters including Chewbacca and X-wing to NASA's Johnson Space Center in Houston, where it was packed into a shuttle locker and taken to NASA's Kennedy Space Center for loading aboard Discovery. ducted eight spacewalks, said there is a symbolic tie between the lightsaber and the real-life work NASA does in space. reality as far as what we do, and it's only just time, really, tion when I was growing up," he said. "I think it's a neat link because it combines two space themes all at one time." The lightsaber will spend 14 days in orbit on mission STSIt will be on display at the Space Center in Houston after the mission. related item has gone into orbit, though. Reilly said astronauts have taken small Star Wars toys into space with them when asked. "People have taken toy mementos, things like a Star Wars toy that might have meant something in their life, so there are any number of things that might be just a little out of the ordinary," he said. More solemn markers have also ac companied astronauts. For example, Reilly's STS-117 mission carried a medal earned by a World War II pilot who died in the war. tinely carried by the dozens or more on and many going as awards to shuttle work ers and VIPs. "I think it makes it real," astronaut Rick Arnold said. "I lived in several countries and I think it's nice to be able to countries as a thank you." From historical to pop culture, artifacts hitchhike for ride in space is just starting to contemplate what to take with him to mark the occasion. "There's not a lot of room for personal items," he said. Wedding rings and other small tokens are often taken into meaning. Each crew member is allowed to take about two paratively tiny area. Astronaut Stephanie Wilson took a sheet of music from the Boston Symphony Orchestra onboard Discovery for mis sion STS-120. The music comes from Beethoven's "Ode to Joy," a favorite in the orchestra's extensive repertoire. Wilson worked at one time in a music store in Tanglewood, Mass., which is the summer home of the orchestra. Some items never leave space, notably mission emblems like those stuck to the walls inside the International Space Sta tion. Another example is a golf ball astronaut Alan Shepard car ried to the moon on Apollo 14 and hit with an improvised club. Moonwalker Charles Duke left a portrait of his family on the lunar surface. Thousands of signatures have also gone into the solar system in the form of computer codes imprinted on compact Whether they go into space to stay or to be appreciated home. "When you get the chance to deliver that stuff back to your family and friends, they're really excited about it," Reilly said. (Above) The original lightsaber used by Luke Skywalker in the lm Star Wars was stowed on Discovery for its launch to the International Space Station on mission STS-120. Taking the science-ction weapon into space commemorates the 30th anniversary of the lm. The saber will be taken to Houston for display at the Space Center after Discovery returns to Earth Nov. 7. (Left) The Wright brothers plane made its historic ight in 1903 on the sands of Kitty Hawk, N.C. In July 1969, a piece of the plane ew farther than could be imag ined at that time when it traveled on Apollo 11 for the rst manned lunar landing. Page 6 2007 SPACEPORT NEWS By Steven Siceloff Staff Writer A the new Orion spacecraft and Ares I rocket of the Constella tion Program, engineers are prepar ing to install a new kind of depar ture system to evacuate astronauts. The agency calls it the Orion Emergency Egress System, but it is fundamentally a group of multipassenger cars on a set of rails reminiscent of a roller coaster. Its purpose is to move astronauts and the ground crew quickly from the vehicle entry on the launch pad to a protective concrete bunker in case of an emergency. Similar systems have been built into launch pads since the Saturn rockets and for the space shuttle. Both earlier systems were cables running from the spacecrafts crew ingress level to an area near a bun ker. There has never been an emer gency on the pad that required the crew use these systems. For Orion, the railcar would stand some 380 feet above the ground. It will be at the same height as the hatch on the Orion capsule, which is where the as tronaut crews enter the spacecraft before launch. Kelli Maloney, the lead design er for the launch pad escape sys tem, said a trade study showed the railcar best met NASA's require ments. Those requirements call for astronauts to be able to get out of the spacecraft and into the bunker within 4 minutes. system, Maloney said, is that the track can take the astronauts direct ly to the bunker door. That would be a big help if one of the crew members or a ground crew member was incapacitated. Scott Colloredo, NASA's senior project integrator for Constellation ground systems, said the group called on the world's roller coaster designers for help with the concept. "It's obviously not a thrill ride, but we're taking advantage of tech nology that's there," he said. Astronauts to ride rails for emergency exit from Orion An artist's concept of the Ares I launch pad shows the new evacuation system on the right. Astronauts and the ground crew could leave the capsule and ride a railcar (top right of the tower) like a roller coaster down to a bunker for protection. The path would be marked with yellow and black arrows. NASA, contractors form board for small businesses T HE prime contractors for NASA and the Kennedy Space Center recently signed the charter for the NASA/KSC Prime Con tractor Board. The board was formed to fos ter the development, operation, improvement of the Small Business Members of the board represent Kennedy and NASA, as well as onsite/near-site, mission support and operational prime contractors. The board comprises a Working Committee to identify appropriate action items and develop potential solutions and approaches, and an Executive Committee to establish policy, direction and strategies. Contractors represented on the committees are The Boeing Company, Space Gateway Sup Aerospace Corp., C&C Interna tional, Dynamac Corp., Delaware North Inc. and Chickasaw Nation Industries. Space Gateway Support Director of Con tracts Victoria Lockard signs the charter; at left is Small Business Liaison Cindi Minter. S igning the charter is NASA Director of Procurement Dudley Cannon (right), along with Larry Third (left) of the NASA Industry Assistance Ofce and KSC Small Business Special ist Connie Wilcox (center). This artitsts concept shows Ares I on the launch pad next to the launch tower. November 2, 2007 Page 7 Remembering Our Heritage SPACEPORT NEWS Apollo launch team in two sites July 16, 1969: Members of the Kennedy Space Center Govern ment-Industry Team rise from the consoles in the Launch Control Center to watch the Apollo 11 liftoff. B nedy Space Center workers who donated items to the Make a Difference Day Project, about 1,000 Brevard County residents will receive basic necessities such as canned vegetables, pasta, sham poo and diapers. After two months of work, vol unteers loaded three vehicles with the donations and delivered them to the Brevard Sharing Centers in Titusville and Cocoa on Oct. 26. These goods are certainly needed, seeing that the crisis service 2-1-1 Brevard received 11,328 calls for KSC makes a difference Chau Le and Sandra Getter nish loading one of two vans and an SUV used to collect donations for the Make A Difference Day Project to take to Brevard Sharing Centers. year. The project was formally launched three years ago and is coordinated by the Federally Em ployed Women, or FEW, organiza tion. We cant do something like this if people arent willing to help, and these volunteers have been very gracious, said Sandra Getter, Community Outreach Chairwoman for FEWs Space Coast chapter. Charity begins at home. Here we are in Brevard County with people who cant afford food. We with jobs should give back. By Kay Grinter Reference Librarian F OR the Apollo Program, blockhouses located on the perimeters of the pads be ing rooms were safely tucked away miles from either Pad A or Pad B in for the Industrial Design of the located on the building's third room housed 470 monitors and consoles for guiding the assembly and checkout of a Saturn vehicle in the bays of the Vehicle Assem bly Building and controlling the launches from both pads. on the launch team in Firing Room 1, also known as FR1, for the Apollo 11 launch. A division chief erations, he oversaw the electrical networks and gyroscope position ing of the Saturn V. Now retired, he recalled from his home on Merritt Island: "Those of us at the west, away from the pads. Once we had the vehicle off the pad, Mission Control in Houston took control. Only then did we stand up and turn around to watch liftoff through the win dows." The photos showing a jubilant launch team in FR1 only captured part of the picture, though. The teams controlling the command service module and were stationed in the Acceptance Checkout Equipment, or ACE, con trol rooms in the Operations and Checkout Building about 10 miles away. At the heart of these six rooms was a computer system that could process 34,000 samples of test data per second from the checkout systems. Data collected in the ACE control rooms was transmitted to FR1, where it was monitored for any problems. Charlie Mars was NASA's chief lunar module project engineer in Spacecraft Operations at Kennedy and was in the ACE control room for the Apollo 11 launch. Now Space Walk of Fame Museum in Titusville, he recalled: "The control rooms had windows that looked into the building's high bay. Smallscreen black-and-white televisions were mounted on the walls for our launch-viewing pleasure." Daniel Evans was a young engineer also assigned to the Checkout Equipment Branch of Spacecraft Operations. Now senior ment in International Space Station and Spacecraft Processing at Ken nedy, he recalled: "I worked third shift in the ACE control room for the lunar module for Apollo 11, but I was on console for the launch of Apollo 13." The ACE Station 3 in the Operations & Checkout Building on Jan. 15, 1969, where person nel support an integrated systems test on lunar module 3, part of the ight readiness test for Apollo 9. Leaning, at right, is Daniel Evans, now a senior manager at Kennedy.